The purpose of this study was to investigate the effects of baicalein on the pharmacokinetics of tamoxifen and its active metabolite, 4-hydroxytamoxifen, in rats. Tamoxifen and baicalein interact with cytochrome P450 (CYP) enzymes and P-glycoprotein (P-gp), and the increase in the use of health supplements may result in baicalein being taken concomitantly with tamoxifen as a combination therapy to treat orprevent cancer diseases. 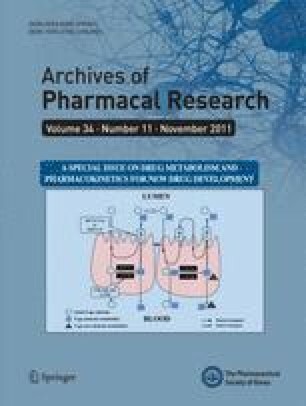 Pharmacokinetic parameters of tamoxifen and 4-hydroxytamoxifen were determined in rats after an oral administration of tamoxifen (10 mg/kg) to rats in the presence and absence of baicalein (0.5, 3, and 10 mg/kg). Compared to the oral control group (given tamoxifen alone), the area under the plasma concentration-time curve and the peak plasma concentration of tamoxifen were significantly increased by 47.6–89.1% and 54.8–100.0%, respectively. The total body clearance was significantly decreased (3 and 10 mg/kg) by baicalein. Consequently, the absolute bioavailability of tamoxifen in the presence of baicalein (3 and 10 mg/kg) was significantly increased by 47.5–89.1% compared with the oral control group (20.2%). The metabolite-parent AUC ratio of tamoxifen was significantly reduced, implying that the formation of 4-hydroxytamoxifen was considerably affected by baicalein. Baicalein enhanced the oral bioavailability of tamoxifen, which may be mainly attributable to inhibition of the CYP3A4-mediated metabolism of tamoxifen in the small intestine and/or in the liver, and inhibition of the P-gp efflux pump in the small intestine and/or reduction of total body clearance by baicalein.